If you follow Soul Asylum then you know they had a few hits like “Somebody To Shove,” “Black Gold,” and their biggest hit “Runaway Train” (which was used in an ad for missing children). They were never considered a headline act because they came to be when The Replacements and Husker Du did also. But they pressed on and produced their brand of college rock. When they did hit it big with the single “Runaway Train” most of the fans from other bands turned their heads toward Soul Asylum's direction. They changed their style to more of a straight forward rock approach and this helped them pick up a few new fans and chart them way above their “B” status. Soul Asylum still stick with their Tom Petty-ish formula on “Candy From A Stranger.” This album is not one of their best and part of that problem might be due to the tragedy that befell them when, in 1995, bassist Karl Mueller lost his battle with cancer. Soul Asylum: Dave Pirner – vocals, guitar; Daniel Murphy – guitar; vocals; Karl Mueller – bass; Sterling Campbell – drums. 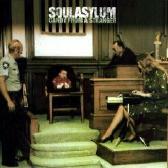 For more information, check out www.soulasylum.com.